Final 4 performances of A Tuna Christmas are this week! This rare holiday treat is coming to an end! I laughed till my sides hurt! - Ellen T.
I have no idea how they did those characters - after a while I stopped trying to figure it out and just sat in amazement! - Bob M.
This was a family tradition for years. I'm so glad you are back! - Jimmy K.
A few tickets are still available - be sure to get them today! 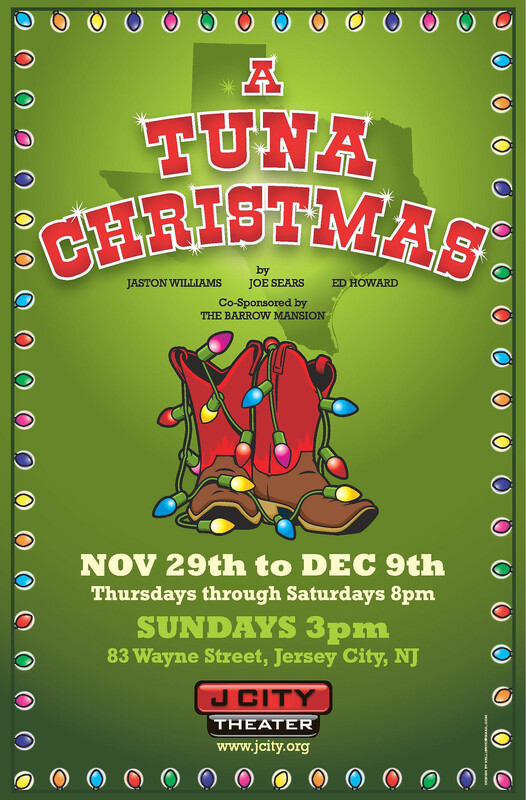 For the first time in 5 years, J CITY Theater will open “A TUNA CHRISTMAS” by Jaston Williams, Joe Sears, and Ed Howard. Opening night is November 29th and the show runs Thursdays thru Saturdays at 8pm with Sunday Matinees at 3pm. This is a limited run and audiences are encouraged to reserve tickets due to limited seating. The show is scheduled to close on December 9th. Back by popular demand, "A TUNA CHRISTMAS" is a marathon Christmas comedy of southern madness. The Christmas yard display contest is heating up in the small town of Tuna, Texas as neighbor fights neighbor for the most outrageous display of lights, Santas, Baby Jesus' and Rudolphs. This year however, there is a Christmas Phantom on the loose, spreading vandalism and havoc. With quick-change zaniness and quicksilver one-liners, two incredibly talented actors introduce us to 22 of the wildest citizens in Tuna, Texas. TECHNICOLOR DREAMCOAT - as well as countless Off Broadway, regional and touring productions over his distinguished career. Sandy Cockrell, Artistic Director, said that the show is always a great change of pace for the company. "We pride ourselves on our motto: theater in the raw. As a production team our focus has always been on the actor and the purity of each particular story. However with Tuna Christmas we really have to pull out all the technical stops. The comedy is found in the quick changes and the bizarre costumes and wigs...the fact that two actors are portraying 22 characters. This show is a wild and breathless ride."